Meet the Cheese Ball Chick! How’d this all start anyway? It was in the spring of 2008 and I was returning to Minneapolis from speaking at a conference in Virginia. It was there that I had been coaxed into bringing some left over cheese balls home to my three nephews. 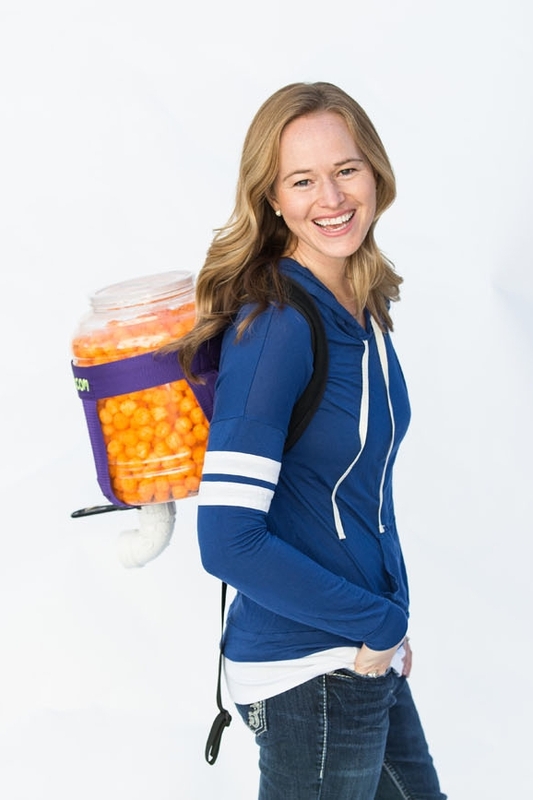 The big awkward container of cheese balls was wedged between my arm and my body as I waddled with my backpack and suitcase through the Virginia Beach airport. I was somewhere between La La Land and the yellow brick road in my mind, but I still managed to notice the growing grins around me. It seemed as though everyone I passed was motivated to smile as my cheese balls and I passed by. When I got to security and sent the big container through the x-ray, I was greeted on the other side by eight smiling guards, all curiously, yet joyously eyeing my cheese balls. I opened the container to offer my new friends some snacks, but they politely refused. I left them smiling as I boarded the plane home. Shortly after take off, the flight attendant drew everyone’s attention as he announced that snacks would be provided by “The Cheese Ball Lady in Isle 9D” over the intercom. This happened not just once or twice, but 3 different times! I had joked about it once or twice with the folks around me, but no one was willing to reach their hand in the open container. As my journey progressed to the Chicago O’hare airport, I made some friends as a direct result of my cheeseballs. It was becoming hard to deny the fact that these cheese balls were slowly bringing the world together. I finally returned home and shared my jovial adventures with others. It was over dinner that the plans began to unfold and I thought, “Why not carry them around as a way to make people smile?” After all, I had recently heard a statistic that the average person only laughs ten times a day and in the light of that realization and being issued a challenge by my friends, I decided that I was going to bring joy to the world one cheese ball at a time. The first step was creating a duct tape harness. Then I wore it out in public. Lots of people laughed and it started great conversations, but no one wanted to eat my cheese balls. So, I determined to make a sanitary dispensing system and enlisted the help of my brother, Andy, and Jim, an innocent by stander, employed at Home Depot. When Jim approached my brother and I in the PVC isle, he had no idea what he was getting in to. Now he’s got a verse of a song dedicated to him! That is the beginning of my story. In April of 2008, I officially began dispensing cheese balls to the public. Don’t worry about germs or freshness because each container is guaranteed fresh with a sealed top, ensuring sanitary cheese balls every time! Be sure to check out my blog on this site, but to see the history and a ton of videos and pictures, take a trip to my original blog by clicking HERE! After a few minutes of conversing with my new friendly flight attendants, Dorrie turned to me and asked, “How do you deal with tough times?” Wow! That’s the kind of question you pray you’ll hear from someone, but can’t believe it when you do! Guilty! Cheese Balls on the Mouth! Why do you carry cheese balls around? To make people smile and to make them feel valuable. How did you come up with the idea? I had a crazy fun experience in an airport as I was bringing some cheese balls home to my nephews and niece. To see the whole story, click here. How long have you been doing this? My first container went “live” in March of 2008. How many cheese ball containers have you gone through? As of 2018, I’ve gone through over 160 containers. Do you wear them to work? Yes and no. I wear them to speaking events of course - which is part of my work. However, this year I've also had an internship in counseling for grad school, and I don't usually wear them to work. However, I did get "busted" by a few clients who googled me and demanded that I bring cheese balls into the session. So I did :). What’s the craziest place you’ve worn your back pack? It’s hard to pick so I’ll let you decide! Motorcycling, downhill skiing, rollerblading, roller-skating, zip lining, swimming, my wedding, Target Field, Progressive Field, the Metrodome, planes, trains and automobiles, Venice Beach, California, Niagara Falls, the beaches of Kenai, Alaska, the streets of Toronto, Canada, and the market in Antigua, Guatemala, to name a few. Have you ever been denied access somewhere because of them? I was denied access to a concert at a club, but the bouncer kept an eye on them for me. I was also not allowed to bring them into Nashville’s Hockey Arena, but they let me “check” them at the desk. Honestly though, it seems I get a lot of special privileges wearing them, and often they are allowed in places that would otherwise claim a strict “no food” policy. I think it’s because people look at my cheese ball backpack more as an art piece or an oversized purse. I’ve been given free desserts at restaurants, been brought cookies from First Class when flying and have received discounts when shopping. Has anyone ever gotten mad at you or reacted poorly? I can only remember 2 incidents in the last 3 years. The first one happened on a flight out to Washington. The flight attendants invited me to hand out cheese balls to the entire plane, and of course I readily agreed. After going in and out of my window seat a few times, I apologized to the older gentleman seated on the aisle, and as a gesture, I offered him a cheese ball. He replied in a gruff, impatient voice, “Eating a cheese ball is the last thing that I would do”. The other incident happened at Wells Fargo. As I was leaving, the manager stopped me to quench her curiosity. As I shared my tag line, “bringing joy to the world…” a very disgruntled stranger butted in and said, “You know, there’s a lot more needs you could meet in this world than handing out junk food.” After a deep breath and a pause to make sure I was composed, I replied by telling him, “I completely agree and do my best to not only meet those tangible needs but to encourage others to do so.” He calmed down and looked a little embarrassed for his misdirected outburst. What would make you want to be so nice to people you don’t even know? If you saw the looks on people’s faces when they see and experience the cheese balls, you’d know why I do it! A smile is contagious and if I can encourage someone else to pass it on, then I am quite satisfied. I hope to have a ripple effect. Are you doing this for a specific cause or charity? Though I’ve been offered money numerous times in exchange for cheese balls, I always turn it down. As far as causes… I hope that my friendly gestures and random acts of kindness cause people to reflect on what their source of joy is. Lots of things make me laugh, but my lasting source of joy is my relationship with Jesus Christ. In my interactions with people, I am often given the opportunity to share about my faith. When invited, I love to share about the Giver of genuine joy, peace and hope. If you followed me around, you’d quickly learn that I treat each encounter uniquely. There is no agenda, but to laugh, listen and inspire. How long does it take you to empty a container? On average, 2.5 weeks. However, there have been a few times when I have emptied an entire container while speaking at a junior high weekend retreat. Middle school kids are my biggest fans and quickest cheese ball consumers! How many places have you brought your cheese balls? My cheese balls have been to 30 of the 50 states and 7 countries. Did you wear them at your wedding? Yes, but not down the aisle. There are some boundaries ;-). Do you wear them everywhere you go? I wear the cheese balls almosteverywhere I go. Sometimes there are places or situations in which it would be inappropriate such as a funeral or a cheese balls anonymous support group. Also, if I am sick or can’t give gawkers the time and explanation they deserve, then I’ll leave them behind. I wear them about 80% of the places I go. Doesn’t airport security give you trouble for flying with them? Airport security guards are some of my biggest fans. It’s a pleasure to bring some fun to their routine. I always enjoy explaining myself. Since I fly often and bring them on all my trips, there are always a few airport personnel at the Minneapolis/St. Paul Airport that recognize me each time I fly! Do you wear them around your house? No. Don’t you think I deserve a break? Where can I get my own dispenser? At this time there is only one cheese ball dispenser that exists (mine), but stay tuned because they may be available for purchase sometime in the future. Best of luck if you try to make your own, because my plans are a secret . Do you ever get sick of wearing them? I admit that sometimes I am not feeling up to the demands that come with being the Cheese Ball Chick. As you can imagine, it requires lots of conversations, answering the same questions over and over again, and always being “on”. But the benefits far outweigh any inconveniences, and I really do find it a joy to wear them. There have been a few times that I’ve begrudgingly put them on out of duty only to end up having a fun and unique experience that left me smiling and grateful. What does your husband think of you doing this? Let me start off by saying that I can’t imagine a more perfect man for me. Craig is so patient, easy going, gracious and supportive. I guess it helps that I wore them on our first date, so he knew what he was getting into! On the few occasions that I’ve second guessed wearing them out somewhere, he’s been the one to encourage me to bring them along. He even assured me that he wouldn’t mind if I brought them on our honeymoon to Cancun. I wanted to start our marriage off right so I did NOT take him up on that offer.